Native Range: Most of eastern United States and southeastern Canada in Atlantic, Great Lakes, Hudson Bay, Mississippi, and Gulf basins as far west as Manitoba, eastern Montana, Wyoming, Colorado, eastern Oklahoma, and eastern Texas, but absent from southern Georgia and peninsular Florida; isolated population in upper Pecos and Canadian River systems, New Mexico (Page and Burr 1991). Table 1. States with nonindigenous occurrences, the earliest and latest observations in each state, and the tally and names of HUCs with observations†. Names and dates are hyperlinked to their relevant specimen records. The list of references for all nonindigenous occurrences of Semotilus atromaculatus are found here. Means of Introduction: Most introductions probably via bait bucket release. Woodling (1985) stated that the Colorado West Slope populations are the result of accidental introduction by man. Hubbs (1957) stated that western records in Texas, and a report from Lake Texoma "have undoubtedly resulted from bait release." Status: Introduced populations are established in Colorado and Wyoming; probably established in Utah. The species has been present in the Snake River, Green River drainage, since at least the 1940s, but never in abundance (Holden and Stalnaker 1975). Status unknown in Texas. Impact of Introduction: According to Baxter and Simon (1970), in some situations populations of this species may compete with trout, but the authors did not give details. Beckman (1974) reported that Creek Chub prey on trout. Magnan and Fitzgerald (1984) provided evidence that introduced Creek Chub are a potential competitor with brook charr Salvelinus fontinalis. In their study of a Quebec stream, they found that charr changed their diet from benthic invertebrates to zooplankton in the presence of chub. 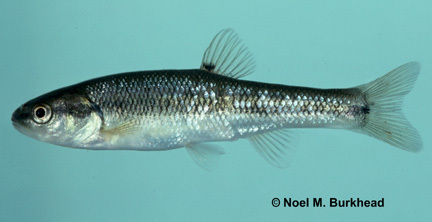 Subsequent laboratory experiments suggested that higher relative abundance of Creek Chub was one of several important factors in the observed niche shift of brook charr in nature (Magnan and Fitzgerald 1984). Competition with and predation by nonnative species (i.e., Catostomus sp., Creek Chub Semotilus atromaculatus, redside shiner Richardsonius balteatus, burbot Lota lota, brown trout Salmo trutta, and lake trout Salvelinus namaycush) limit populations of the rare bluehead sucker Catostomus discobolus (Wyoming Game and Fish Department 2010). Remarks: This species is a commonly used baitfish (Baxter and Simon 1970; Scott and Crossman 1973; Beckman 1974). Tyus et al. (1982) gave a distribution map of the this species in the upper Colorado basin. Beckman, W.C. 1974. Guide to the fishes of Colorado. University of Colorado Museum, Boulder, Colorado. Magnan, P., and G.J. Fitzgerald. 1984. Mechanisms responsible for the niche shift of brook char, Salvelinus fontinalis Mitchill, when living sympatrically with creek chub, Semotilus atromaculatus Mitchill. Canadian Journal of Zoology 62:1543-1555.